Definition at line 474 of file lltransfermanager.h. Definition at line 1323 of file lltransfermanager.cpp. Definition at line 478 of file lltransfermanager.h. Definition at line 486 of file lltransfermanager.h. Definition at line 489 of file lltransfermanager.h. Definition at line 490 of file lltransfermanager.h. Definition at line 488 of file lltransfermanager.h. Definition at line 487 of file lltransfermanager.h. Definition at line 1345 of file lltransfermanager.cpp. References mAgentID, mEstateAssetType, mSessionID, LLDataPacker::packS32(), and LLDataPacker::packUUID(). Definition at line 1328 of file lltransfermanager.cpp. Definition at line 1339 of file lltransfermanager.cpp. Definition at line 1334 of file lltransfermanager.cpp. Definition at line 1356 of file lltransfermanager.cpp. References mAgentID, mEstateAssetType, mSessionID, S32, TRUE, LLDataPacker::unpackS32(), and LLDataPacker::unpackUUID(). Definition at line 493 of file lltransfermanager.h. 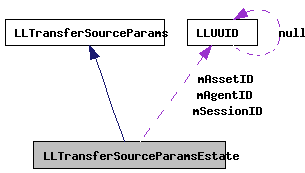 Referenced by getAgentID(), packParams(), setAgentSession(), and unpackParams(). Definition at line 497 of file lltransfermanager.h. Referenced by getAssetID(), and setAsset(). Definition at line 498 of file lltransfermanager.h. Referenced by getAssetType(), and setAsset(). Definition at line 495 of file lltransfermanager.h. Referenced by getEstateAssetType(), packParams(), setEstateAssetType(), and unpackParams(). Definition at line 494 of file lltransfermanager.h. Referenced by getSessionID(), packParams(), setAgentSession(), and unpackParams().